I have some wonderful males available for stud service. My program here for my male dachshunds concentrates on body structure but more importantly it concentrates on TEMPERAMENT. I will only use males who are extremely friendly, NOT stranger agressive, and who consistently produce puppies like them. I believe this more relaxed environment decreases stress on the girls, especially since they are not subject to many dogs barking at them. Below are studs that I am currently using in my program. You are also welcome to visit the boys at their family homes. 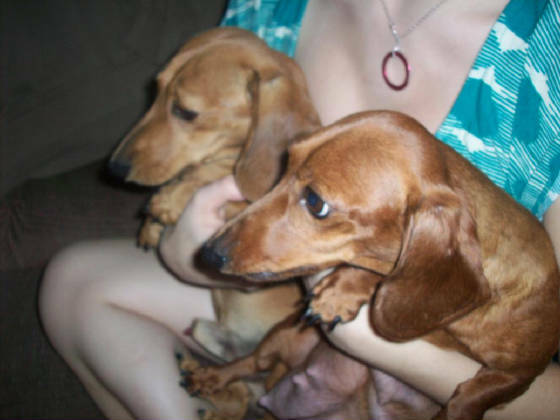 I am a specialist in Dachshund Color Genetics and can assist you in determining which male would be best for you to get the desired color in your puppies. I am also trained in Artificial Insemination for agressive or non-compliant females. This is a very NON TRAUMATIC procedure, no extra charge for this service. We call this boy ROMIE. He is a Smooth English Cream. Romie lives with Lynn and her family in Hastings Michigan. Romie produces wonderful puppies in Red, Cream, Chocolate/Tan and Chocolate/Cream color. we call this boy "BAM" he is a longhair Black/Cream English Cream.He is so incredibly playful and friendly. Bam currently lives with me in Grandville Michigan.Bam produces puppies in Cream, ee Cream, Black/Cream, Chocolate/Cream, Red, ee Red, Black/Tan, and Chocolate/Tan colors. Below is a picture of Tommy aka WEBSTERS DESIGNER GENES V JODACHS. He is in the picture to the left, Krystal is on the right. Tommy is such a mellow little guy. 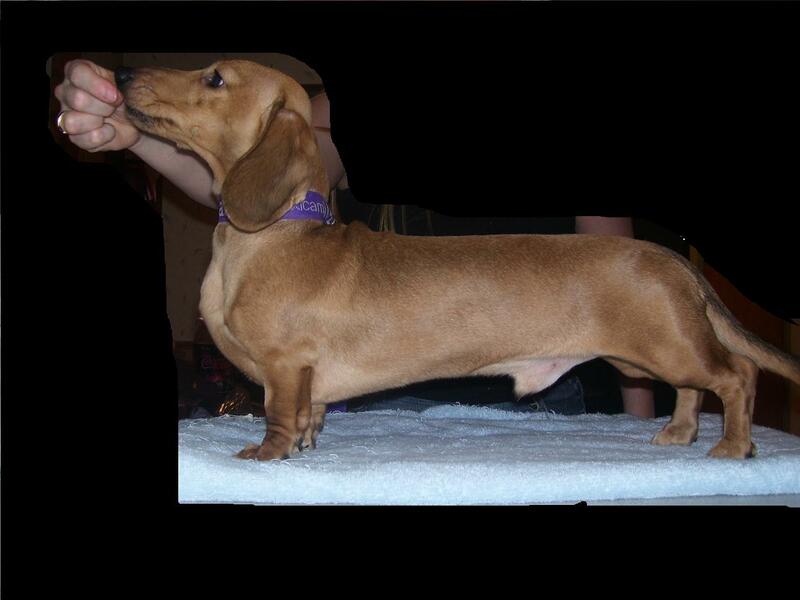 He has very short legs and produces wonderful puppies in Red, Cream, Black/tan, and Black/Cream colors. Tommy lives with Lori and her family in Cedar Springs Michigan. I have two more males not pictured here yet. One lives with Tommy in Cedar Springs. His name is Connor aka "JODACHS CUSTOM MADE" Connor is a Smooth English Cream boy who produces puppies in Cream and Red so far. 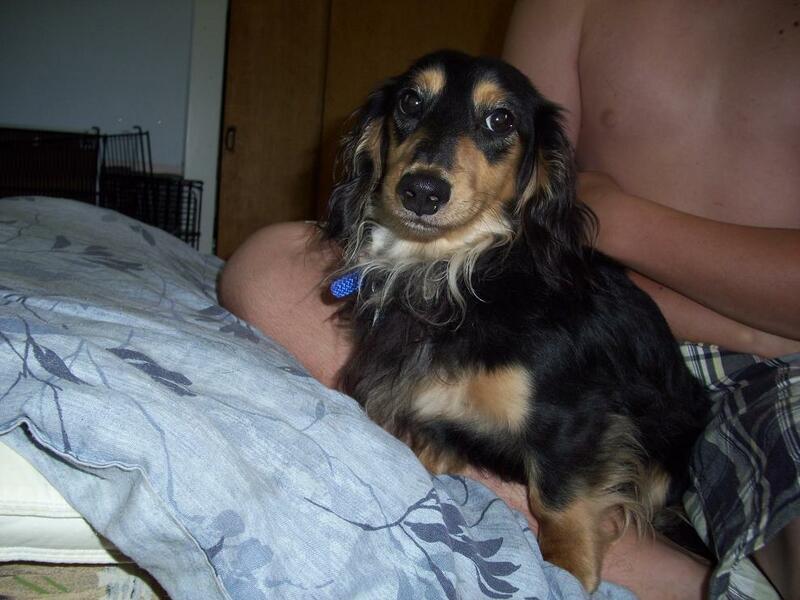 The second boy is Sky who lives with Mark and his wife in Wyoming Michigan. Sky is a Red Smooth boy who carries for English Cream. Sky can produce puppies that are Cream, Black/Cream, Red, and Black/Tan. I will be updating pictures of Tommy, Connor and Sky very soon.